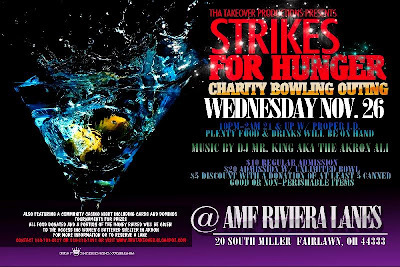 Event We Support: Tha Takeover Productions and DJ Mr. King Present The First Annual "Strikes For Hunger" Charity Bowling in Fairlawn, OH | BlackRadioIsBack.com - Official Blog of the Syndicated FuseBox Radio Broadcast! My people's Tha Takeover Productions and DJ Mr. King in Ohio are holding this event right before Thanksgiving Weekend, so for our BlackRadioIsBack.com readers and FuseBox Radio Broadcast listeners in that area, go out if you can and support a good cause! In their continuing effort to increase community involvement in the city of Akron, Tha Takeover Productions and DJ Mr. King will be hosting its First Annual "Strikes For Hunger" Charity Bowling outing, November 26, 2008 at AMF Riviera Lanes located at 20 South Miller Road in Fairlawn, Ohio from 10pm-2am. Through the "Strikes for Hunger" campaign, Tha Takeover Productions are looking to raise more than $1,000 in food an donations, which will be given to ACCESS Inc. Battered Women's Shelter. In addition to the bowling outing, the event will also contain a live DJ as well as a community casino night where patrons can enjoy card, billiards and arcade games. Freddy Robertson, co-CEO of Tha Takeover Production, said his company chose ACCESS Inc. as its charity to donate to because of its significance to develop and strengthen single parent households. "Being raised in a single parent home, I am able to relate to the struggles of a woman making sacrifices for the well being of her child," said Robertson, a 24-year-old graduate of The Ohio State University. "It was the will of strong women that not only pushed me along, but my partners as well. We were all able to gradute from college and are doing out best to provide our community with positive role models. Giving back to a charity that looks to assist the family "make-up" that we are products of is very fulfilling." Patrons are encouraged to bring at least five (5) canned food goods or non-perishable items during the night of the event. Admission starts at $10. For more information contact Tha Takeover Productions contact Fred 330-701-7891 or via email at thatakeoverproductions@gmail.com.